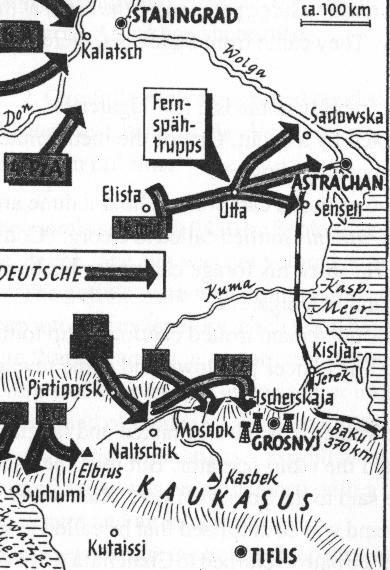 It was September 13, 1942, east of Elista in the Kalmuck Steppe. "Hey, Georg, get ready, we leave in an hour!" Cossack, then he roared off. from there. Therefore the area had to be kept under surveillance. name of the "Greyhound Division." the steppe. The sun was not yet up and it was still very cold. water and one with rations - as well as a repair squad completed the equipment. back and set out again the next day under the command of Leutnant Euler. from the Volga. From the high sand dunes he had a good view across to the river. patrols always found a way. be many of them there." "Aha." Georg nodded and gave the friendly nomads a few cigarettes. toward the north. Two riders were approaching: Soviets. motorcycle coat, sat down on the well and lit a cigarette. Oberleutnant Gottlieb and his men watched as the two talked and laughed. Georg whip out his pistol. Grinning, he said to the Soviet officer: "Ruki werch!" whether troops were being sent across the Volga in this area north of Astrakhan. big it looked as if an entire panzer regiment was driving across the endless plain. of "Operation Barbarossa" and had thus come closest to this campaign objective. of the lower Volga by the Soviets. two Russians who were running through the terrain in the general excitement. but now it was time to be off! a usable rail line from Kizlyar to Astrakhan which was not indicated on any maps. have been used for transporting troops. suddenly appeared in the south. "A train," shouted the workers. coals whirled through the air. The train stopped. Car after car went up in flames. "Damn, that lovely gas," grumbled the gunners. interpreter. Grinning, the interpreter took the phone: "Stanzia senseli, natshalnik." "Da, da, tovarich," he said reassuringly. received seemed to justify his suspicion. the game and said: "Just wait, little father, we'll be in Astrakhan soon." wooden station at Senseli blew up with the aid of two explosive charges. Weichs, who by chance was at the command post. paradise and thus reach one of the decisive objectives of the summer campaign.